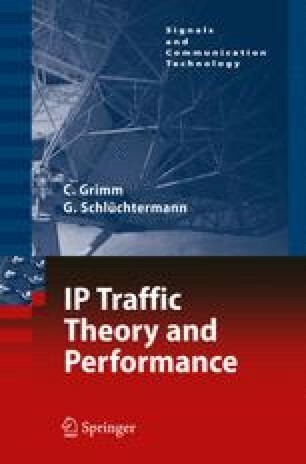 In this chapter we will deal with the problem of determine waiting queues in various models as well as some aspects of optimization. It is obvious that we cannot cover the full range of approaches, offered by the research community. In this respect, we will provide suitable literature for the interested reader. Our optimization approaches will be twofold: first on the basis of network flows, given by the formulas of fractional Brownian motion (and here in particular of the Norros model as introduced in the section 3.3.4), second optimization techniques, once by applying the Lyapunov function (and here for deterministic traffic description) as well as an optimal control approach using stochastic optimization, which is initiated in economics. Hence, at the end of this chapter we will enter the optimization not purely from the network view, but as optimization from the equilibrium point of view given by the offer of the network provider and the user as consumer.